Three people have been injured after a train hit overhead power lines at a Monmouthshire station. They were hit by the falling cables at Abergavenny after the lines were disrupted by an Arriva Trains Wales service travelling from Holyhead at about 18:00 BST. The three were taken to hospital but have since been discharged with minor bruising, Network Rail said. Arriva Trains Wales said services had been severely disrupted as a result. A statement on Arriva's website said: "Due to a fault with line side equipment at Abergavenny, services along this route are severely disrupted. "Long distance customers (i.e. Cardiff to/from Manchester) intending to use this line are advised to use alternative routes via Birmingham. "Customers wishing to travel to destinations on this line in the local area (i.e. Hereford) are advised to seek alternative transport as rail replacement buses will be very limited. "Arriva Trains Wales regrets the inconvenience caused and assures customers that everything is being done to resolve the situation as rapidly as possible." 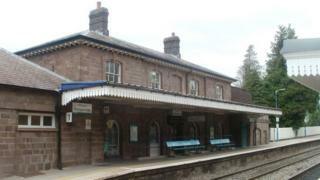 Network Rail said the line towards Hereford had reopened and it hoped the station would reopen on Saturday morning.